Workbook has 2,002 practice test questions. This Companion Guide explains all 2,002 practice questions and each multiple-choice answer from the Workbook. realtime writing, captioning, dictionary building, and vocabulary preparation. 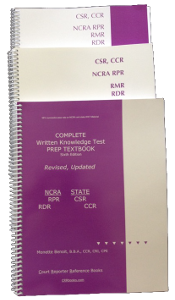 Study The Purple Books To Pass NCRA’s RPR, RDR, and State CSR The First Time! To order this product click on the “Buy Now” link. 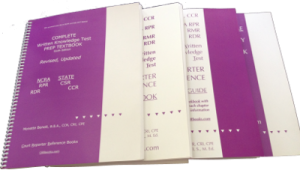 *** The Companion Study Guide can only be used with the NCRA RPR, RDR, State CSR Workbook as it follows each question, 2,002, cross-referencing each Workbook answer, each “a-b-c-d”, to give you much-needed additional information to show where and how words are used. Learn how to answer questions accurately. 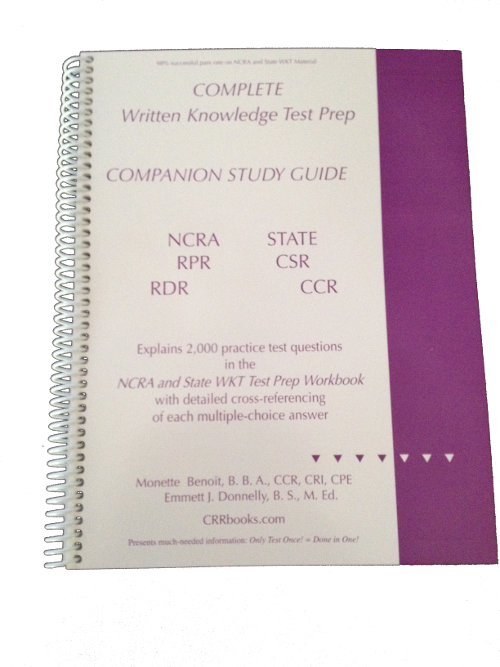 Inside this Companion Study Guide you will find a discussion of each answer in the workbook with cross-referencing of every practice test question, 2,002, and every multple-choice answer in each chapter to assist you to pass a NCRA RPR, RDR, and State CSR written tests. *** Additional explanations have been included to further assist you. The companion study guide enables each person to learn why an answer is correct, incorrect or included as a distracting answer. Study, drill, quiz, review, understand and then … PASS YOUR TEST the first time! court reporters, and CART Captioners. Experienced reporters, CART captioners, judicial realtime writers and students will improve skills and advance credentials. The information is presented in formats that maximize retention. Test Prep Companion Study Guide material assists each to increase retention and gain valuable information on vital topics: Legal terminology; Court procedures and deposition rules; English grammar and vocabulary; Idiomatic expressions; Preposition sentences; Confusing words; Antonyms; Synonyms; Misspelled words; Medical terminology and definitions; prefixes and suffixes; and Computer technology. Learn the method to taking a test to save huge chunks of time. Learn about Written Knowledge Tests and the distracting answer. Material covers much more than previous NCRA RPR, RDR, and State CSR court reporting certification questions, so you expand your knowledge. Learn how to answer the question by studying the foundation of information for NCRA RPR, RDR, and CSR court reporting examinations. To order this product, click on the “Add to Cart” link. The Test Prep Companion Study Guide is a companion book to the workbook. I only wish I would have had them the first time I took it. Everyone I spoke to about you said that you are so proud and enthusiastic about court reporting. It is nice to know there are people like you who are willing to reach out and lend a hand to those who stand in the same position you used to many years ago. Thanks!! You may use my testimonial. Hopefully it will help others.